A) I struggled a lot with the structure. I began by writing short stories. "Chickens" was written as a short story before I'd enrolled in the graduate writing program at the University of Iowa, which is where I started to work more seriously on the material that eventually became Grass Roof, Tin Roof. The largest problem I had, I believe, is that I simply didn't understand what I was doing, technically or artistically, and I spent a lot of time and energy being susceptible to many ideas of form that in the end were not in line with what my ideas and stories actually needed. I wrote a lot of false beginnings, I wrote a lot of fragments. I made a lot of structural plans, trying to imitate what I saw in other books. At some point I stumbled on In Our Time by Hemingway and of course loved it and started trying to imitate that as well. This is the model that ended up proving the most helpful finally, though it took another few years of experimenting before comments from a helpful reader guided me back to looking at the structure of In Our Time. Though I know my book is not a faithful or even apparent carrying-on of that structural tradition, I do like to think of it as a female and "nonwhite" response to that tradition, in a way — and in the time of another war. I will also admit I'm not a prolific novel-reader, and so I like to think there can be a genre that falls somewhere in between the story collection and the narrative novel, which is how I think of Grass Roof, Tin Roof — something as dense as a novel, yet as potentially fragmented as a series of stories. I enjoy stories and short prose that dwells on moments and that dares to be contemplative; I also like the idea of the long story. Perhaps because of the incongruous nature of my own background, perhaps because it is simply indicative of our times, the idea of following seemingly disparate threads to arrive at a not entirely cohesive whole appeals to me. I like fiction that does not offer tidy endings or clear through-lines, that attempts to take into account the complexity of reality. Told from multiple perspectives and interwoven with the intimate reflections of a middle child, Grass Roof, Tin Roof begins with the story of Tran, a Vietnamese writer facing government persecution, who flees her homeland during the exodus of 1975 and brings her two children to the West. Here she marries a Danish American man who has survived a different war. He promises understanding and guidance, but the psychic consequences of his past soon hinder his relationships with the family. The children, for whom the war is now a distant shadow, struggle to understand the world around them on their own terms. In delicate, innovative prose, Strom's characters experience the collision of cultures and the spiritual aftermath of war on the most visceral level. 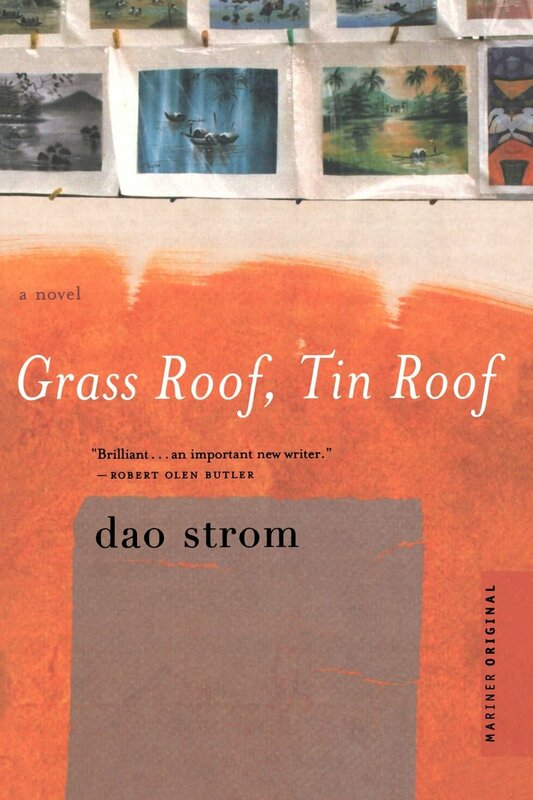 Grass Roof, Tin Roof is a beautiful work of profundity and empathy, powerful emotion and rare insight.